How do I make sure I have the right tag? Each tag will be clearly marked with the bib number of the participant to whom the tag is assigned. Because the timing tags are clearly marked with the runner’s bib number, there is no need for “chip check” or “tag check” at packet pickup. The purpose of traditional chip check was to ensure that the chip given to the runner was the correct chip. Because the tags are already labeled with the runner’s bib number, there is no need to check that the tag is correctly assigned. No. Using the single-use D-tag assigned and given to you before the race is the only method to correctly track your times. Other tags and chips are not compatible with the ChronoTrack system. What is chip time and how is it different from gun time? Tag time (Chip time) is recorded by an electronic tag that is attached to a runner’s shoe. Your tag records the time at which you cross the start line, the finish line and several split times in between. Tag time is often shorter than gun time because tag time begins when a runner crosses the start line while gun time starts when the gun is fired; many runners don’t cross the start line until several minutes after their official gun time has begun. How accurate is chip time? Chip time is the most accurate form of marathon timing available because it measures the exact time between a runner crossing the start line and the finish line. Tag time also records several important splits, providing an accurate record of a runner’s pace. Can I leave the D-tag on my bib? 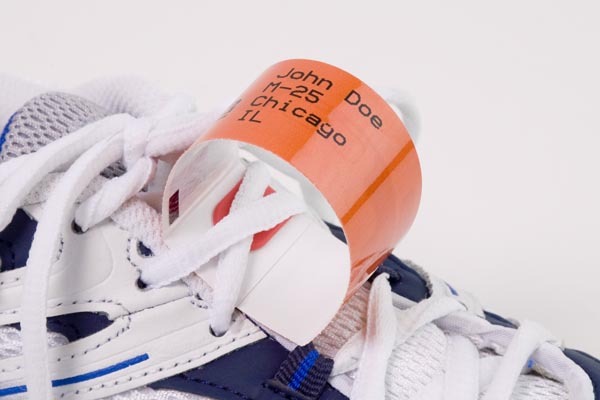 Can I flatten and tuck the whole D-tag in my laces to make sure it stays? Can I create a hole in the D-tag and tie it on? Are you sure the D-tag will stay adhered throughout the race? What if I don’t have laces? The D-tag can also be used by attaching it to your ankle with a Velcro strap. The tag should still be formed to make a “D” shape and then attached with the Velcro. How do I dispose of my D-tag? Do you wanna see how a fellow barefoot runner secured his D-Tag?